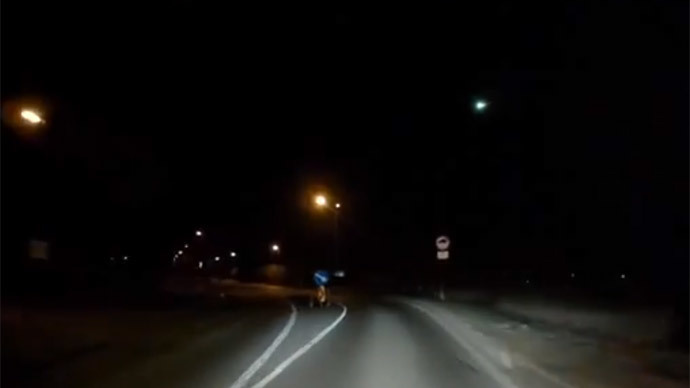 Witnesses reported seeing a green and white meteor flying over Switzerland on Sunday evening, with several dash-cam recordings soaring in popularity on social media sites. Some even reported hearing loud explosions along with the bright lights. The fireball was observed at around 8:50 p.m. local time in Switzerland. It was also reportedly seen in Austria and southern parts of Germany. Witnesses claim the bright object moved in a southern direction across the sky. Some reported hearing two loud explosions on top of seeing the greenish light. “My daughter was on balcony when this happened and she heard a bang. She even felt a slight pressure wave,” one woman told the local newspaper Aargauer Zeitung. “The blast sounded like an explosion,” said another witness. Police in Zurich and Berne allegedly received multiple calls reporting the bright lights in the sky. While observed cases of space objects causing damage by direct impact are extremely rare, fireball explosions can, in fact, be devastating. In February 2013, the Russian city of Chelyabinsk was rocked by a meteor blast that blew out thousands of windows and damaged several buildings in frigid winter weather. Hundreds of people sought medical attention for minor injuries, mostly caused by shattered glass and debris sent flying by the impact wave. The celestial body responsible for the havoc was later discovered on the bottom of a lake outside the city, and was called the Chelyabinsk meteorite.